Brazilian Starfish is a rare, attractive and unusual chilli pepper variety. The plant produces a large amount of fruits that look a lot like starfishes. It originates from Brazil, hence the name Brazilian Starfish. You can grow this variety well in our colder climate. These unusual, special and very attractive chillies ripen from green to bright red. 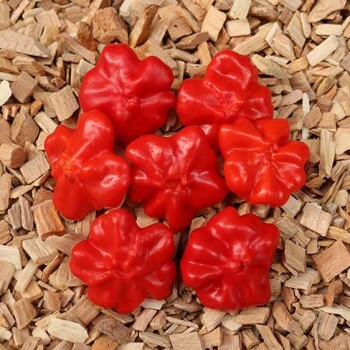 The flavour of this chilli is rather piquant with a hint of sweet fruit. The chillies are disk-shaped and have a diameter of 4 - 5 cm. Use Brazilian Starfish in sauces, sambals, finely chopped in salads or in other recipes. Non hardy annual. Height: 100 - 150 cm.